Current Status: in Grand Lodge Vault; merged into Waltham Triad Lodge, 06/02/2003. No history of Victory Lodge would be complete without some information regarding its real founders, but as this is written for the reading of our posterity, the words following will be confined to those three of our Brethren who have passed to the Great Beyond, and as we write of them as true members of our great Fraternity, so may we trust that posterity may write of us who are still living today. Brother William Henry Iliffe, to whom credit belongs for first suggesting that a new Lodge was needed in Watertown, was a member of Pequossette Lodge. He was born in Coventry, England, and lived in Watertown for about forty years, where he established himself as a Master Builder and rapidly gained the respect and confidence of our citizens. Brothers James Bailey, George H. Dale, Bartlett M. Shaw and G. Frederic Robinson were each invited by Brother Iliffe to bring to a meeting a list of sixty names whom they felt would be interested in the formation of a new Lodge. At that meeting, each name submitted was balloted upon, with the net result that sixty Masons were invited to attend a meeting which was preceded by a dinner in the First Parish House, better known as the Unitarian Building, on February 10, 1920. Brother Iliffe briefly outlined the purpose of the meeting, stating that the Town had about doubled its population during the past decade; that because of the demand for more employees among the several industries in the Town, caused by World War activities, it was apparent that one Lodge would be unable to continue to handle properly the large number of applications that were pouring in for the degrees. He further stated that over ninety applications had been received during one year, and that because the entire time of the officers was of necessity confined to degree work, no other business could be transacted at our regular communications than balloting, and thus it was apparent that the old fraternal spirit was rapidly becoming dormant. A Lodge which was limited to a membership of less than one hundred had many advantages. A free discussion followed, during which strong objections were registered to public installations, that Masonic meetings were for men only; that the number of applications should be limited to twenty-five during each year; that no applications would be received from other than residents of the Town. All of these objections were unanimously sustained, following which a nominating committee submitted the names of George H. Dale for Worshipful Master, Guy H. Nason for Senior Warden, James Bailey for Junior Warden, William S. Holdsworth for Treasurer and Wallace A. Shipton for Secretary, and the election of these officers was unanimous. A committee submitted a list of several names for the new Lodge, but the name "Victory" was finally unanimously chosen. In explanation, it should be noted that the so-called Victory Loan for war financing had brought that word prominently before the public during the previous year. At sundry times, attempts have been made to make the objections noted above obligatory restrictions, but as yet, none of them have been incorporated in our by-laws, although it is of passing interest to note that our present Worshipful Master would have been ineligible to receive an application because of the fact that at the time he applied, he was a resident of Brookline. The fact that his father had been a charter member, and his two brothers were also members, would have had no affect if that limitation had been embodied in our By-laws. Of the original committee, Brother Iliffe was, with difficulty, induced to assume the office of Marshal, a position he held for eight years. Brother Bartlett Murdock Shaw was a man who always retained a very deep interest in town affairs. He was for several years a member of the Board of Selectmen, President of our Savings Bank, a leading spirit in St. John's Methodist Church and Superintendent of the Walker and Pratt Foundry Company, one of the largest industries in Watertown. Brother Shaw was the father of our Worshipful Master elected in 1933, Frederick D. Shaw. Brother James Bailey established and successfully conducted the dyeing and cleansing business which bears his name. Naturally of a very retiring disposition, it was not an easy task to induce him to assume the office of Junior Warden, but he did, and thus became our third Worshipful Master. Abundant evidence of the generosity of our charter members is extant in the regalia and paraphernalia, among which space should be given to explain that the National and State Flags were presented respectively by thirteen Masons in the employ of the Hood Rubber Company, with Worshipful Guy H. Nason as the spokesman for the former and Brother Charles E. Fay for the latter. Upon the staff of the State Flag is a plate which states that it was presented by the "father of the first Candidate raised in Victory Lodge." It is of more than passing interest to note that that candidate was the elder brother of our present Worshipful Master, Brother Allen M. Fay. Another brother, Norman, is now in the service of our country. Several of our members have received signal Masonic honors at various times — Brother Ambrose J. Shipton was the recipient of the Henry Price Medal from Most Worshipful Arthur D. Prince. Brother Shipton, who for over fifty years had been a regular attendant at the communications of both Pequossette and Victory Lodges, was the father of our beloved Secretary and Worshipful A. Lester Shipton, all three of whom were among our charter members, the latter being a Past Master of Pequossette Lodge. Right Worshipful and Reverend Francis Dee Taylor, who was our Worshipful Master in 1930, became District Deputy Grand Master in 1938 and 1939, and in 1944, was made Deputy Grand Master of the Grand Lodge. He also was the recipient of the Henry Price Medal from Most Worshipful Arthur W. Coolidge, and is now a Grand Chaplain of the Grand Lodge. As the welfare of all organizations is dependent upon the men who conduct its affairs, Victory Lodge is fortunate in having four, all of whom are charter members, who have been in office during its entire existence, and each of whom received well merited certificates of excellence from the Lodge at the celebration of our twenty-fifth anniversary, which were presented by Most Worshipful Samuel H. Wragg. Reverend Brother Meredith has been Chaplain for twenty-five years; Brother LeRoy M. Chase has been our Treasurer for twenty-four years; Brother Wallace A. Shipton has been our Secretary for twenty-five years; Worshipful Brother Hugh Goddard has been Senior Deacon, Junior Warden, Senior Warden, Worshipful Master, again Senior Warden and again Worshipful Master, and since February 1927, has been Marshal; also Brother Percy M. Bond, who has been Tyler for twenty-five years, and who, with Worshipful Brother Goddard, has been made an Honorary Member. Both of these Brothers have received service medals from the Grand Lodge. The faithful services rendered by these Brethren not only merits our approbation, but has been of inestimable benefit, not only in building up our organization, but as shining examples to our members. Probably the highlight of our quarter century was the constitution of the Lodge by Most Worshipful Arthur D. Prince on the date of our tenth regular communication February 4,1921 — an event which brought out fifty-seven members and ninety-eight visitors. Following the ceremonial of constitution, the Grand Master sealed a concrete depositary which contains a historical record of the Lodge, various letters, coins and materials of interest. This receptacle is not to be opened until the fiftieth anniversary of the Lodge, in 1971. A photograph of the group was taken after the close of the Lodge, which, along with the depositary, may be seen in the reception room. The Grim Reaper has laid his heavy hand on twenty-three of our charter members. The first of these to pass to the Great Beyond was our first Junior Steward, Brother William S. Jacobson, who departed in 1920, and the latest to occur was Brother John S. Tufts on March 5, 1945. Our third Worshipful Master, James Bailey, passed away in 1933, and Worshipful George E. Esslinger, our twenty-first Master, died in 1943. With the above exceptions, all of our Past Masters are alive today. One of the misfortunes of the present War was the case of Brother (Lieutenant Commander) Edward P. Furber, our Senior Warden during 1944. He had served Victory Lodge in the several stations with great credit to himself and we had every reason to expect that he would be elected as our Worshipful Master. He was called away just two months before our annual communication took place, to study and prepare himself for service in establishing temporary government in conquered countries across the sea. His fellow officers have, however, made a gentlemen's agreement that upon his return he will be recognized as the candidate for Worshipful Master at the next following annual communication. Brother Furber volunteered for service the day after the Pearl Harbor attack, December 8, 1941, and was assigned to duty in Boston, where he stayed until December 1944, when he was sent on duty to California. A recapitulation of the work done during the past twenty-five years shows that the membership grew steadily until 1930, when it reached 134 members. The lowest number was 111 in 1939, but the membership has now grown to 135, on the date of the twenty-fifth anniversary, March 5, 1945. In conclusion, permit me to state that one of the many benefits which accrue to Masons is the privilege of being associated in an intimate way with men who have been tried and found worthy. The history of Victory Lodge is a record of the founding of the Lodge as well as of the fifty years which have followed. Limitations of time and space preclude the possibility of recording the names of all who have labored hard and accomplished much because of their love of Masonry and particularly of Victory Lodge. The record of the events leading up to the organization and the account of the first twenty-five years were the labors of our first Worshipful Master, Rt. Wor. George H. Dale. The detailed history of Victory Lodge from its beginning in 1920 to 1945 by Rt. Wor. George H. Dale may be found in the Proceedings of Grand Lodge for 1945 (pages 5-10, inclusive). The history of the second quarter century was composed by Wor. Roland K. Humphrey, Wor. William S. Holdsworth, and Wor. Vartkis P. DerBoghosian, who wish to pay tribute to the secretaries, Bro. Wallace A. Shipton (1920-1955), and Bro. Arthur Schmall (1956-1961), Wor. Stuart J. Fay (1961-1964), and Wor. Archibald F. Mills (1964-present), for their most complete and well-preserved records without which this history would have been impossible. The years 1945-1970 were active ones for Victory Lodge, which continued to grow under the leadership of a succession of capable Masters and the cooperation of a closely-knit group of Past Masters. The late forties saw the return of a number of our members who were in the service of our country. It was noted in the secretary's records that on February 1, 1946, Wor. Herbert H. Jaynes, who was presiding Master of Belmont Lodge and our present Grand Master, paid a visit to Victory Lodge. On September 7, 1945, Wor. Guy H. Nason received Honorary Membership. Others receiving Honorary Membership during this period were Bro. Rev. Ernest Meredith, Bro. LeRoy M. Chase and Bro. Wallace A. Shipton in March 1947; Wor. George W. Ayer and Wor. William S. Holdsworth in May 1950. A number of our members have distinguished themselves during this quarter century and certainly bear mention in this history. On December 1, 1948, Rt. Wor. and Rev. Francis D. Taylor received the coveted 33rd Degree. In 1954 Rt. Wor. Franklin E. Harris was elected Master of the 34th Lodge of Instruction. The same year saw Wor. Ralph C. Thulin installed Junior Grand Steward of the Grand Lodge. In December of 1957 Rt. Wor. Franklin E. Harris was installed District Deputy Grand Master of the Waltham 5th District. He is also an Honorary member of Victory Lodge and in 1965 was presented the Distinguished Service Medal by Grand Lodge. Rt. Wor. Bro. Harris appointed as his District Deputy Grand Secretary, Wor. Erie L. Chase, our Treasurer since 1955, Honorary Member and present Senior Warden of the 34th Lodge of Instruction. Wor. Paul E. Chase served as District Deputy Grand Marshal. Wor. Leonard Johnson was installed Junior Grand Deacon of the Grand Lodge in December of 1964. At our meeting in December of 1954, a building committee was appointed to work with Pequossette Lodge in planning a new Temple. A fund-raising committee was appointed, and trustees were elected to the Watertown Masonic Associates; and on January 8, 1960, Victory Lodge held the first meeting in the new Temple. At our February 1955 communication, Wor. Wesley E. Monk and Bro. Ambrose L. Shipton joined our Honorary Membership list. June of that year marked the passing of our beloved Treasurer, Bro. LeRoy M. Chase, who had served Victory Lodge in that capacity since its organization in 1920. In January 1956 Bro. Wallace A. Shipton, because of ill health, tendered his resignation as secretary after having held that office since 1920. Brothers Frank D. Emery, Alfred A. Glidden, Harrie C. Patrick, and Homer C. Perkins, our four remaining charter members, received Honorary Membership. The Grim Reaper has removed all but two of our charter members from our midst: Bro. B. Fay McLaughlin, who has taken a demit, and our Senior Past Master, Wor. William S. Holdsworth. On December 3, 1958, the Lodge was saddened by the death of our first Master, Rt. Wor. George A. Dale. A Masonic burial service was held on December 6. In May 1959 the Lodge voted to co-sponsor DeMolay with Pequossette Lodge. Wor. Stuart J. Fay and Wor. Herman H. Sanderson have received the DeMolay Legion of Honor and a number of the Brethren have worked as advisors for both DeMolay and Rainbow. Wor. Bro. Thomas M. Dowell joined the roster of Honorary Members in 1962. Wor. Bro. "Tom" has been the mainstay of our very active service committee and has spent much time and effort seeing that the indisposed members and widows of departed members are not forgotten. Rt. Wor. Franklin E. Harris has taken the initiative to see that the widows are remembered at each Christmas and on each of their birthdays. On July 8, 1962 a special communication was held to honor Bro. Edward Furber, recently appointed Chief Justice of the Trust Territory of the Pacific Islands. A reception was held for Bro. "Ed" and his wife after the meeting. 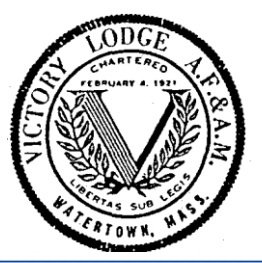 In December of 1964 the Victory Lodge Memorial Fund was established. Contributions are accepted in memory of a departed Brother, and the funds are available at the discretion of the Master or the Service Committee. In October of 1965, Bro. Percy M. Bond retired after 45 years as Tyler of Victory Lodge. An Honorary Member, Percy, assisted by Rt. Wor. Franklin Harris, laid the first brick in our new Temple. The Lodge was deeply grieved when he departed for the Celestial Lodge above on November 2, 1966. At our regular communication on November 4, the Master declared the Lodge in recess; and all present, including the District Deputy Grand Master and his Suite, attended a Masonic Funeral Service for our beloved Tyler. At the same meeting a Memorial, prepared by Wor. George W. Ayer and Wor. Everett Clarke, honoring our late Brother and Secretary, Wor. Stuart J. Fay, was read; and copies were presented to his sons, Brothers Ernest Fay and Stuart Fay, Jr.
At a special communication on July 19, 1967, a funeral service was held for Wor. George W. Ayer, charter member and first Junior Deacon of Victory Lodge. Wor. Bro. George also served the Lodge as ritualist for a number of years and his work in that capacity endeared him to many of the line officers. Victory Lodge has entered into many activities during the past twenty-five years. Our blood program has been emphasized to all the Brethren, and they and their families have donated in the name of Victory Lodge. Bro. Frank Jacobson has given over six gallons. Many evenings, at the 34th Lodge of Instruction, Victory Lodge has had the honor of most officers and members present, setting a record in 1965, 1966 and again in 1969. Visits to the Home in Charlton have been made with dependable regularity. Important among the contributions to Victory Lodge by her Past Masters is the legacy of Wor. Roland K. Humphrey, who during his term as Master celebrated a "Members' Night", during which all line officers stepped down from their stations and were replaced by sideline members who performed the ritual. The participation of sideline members in the work of the Lodge has been marked by its value to the Lodge and recognition of "Members' Night" by succeeding Masters has established it (irmly as an annual function of the Lodge. A special communication of Victory Lodge was held in April of 1958 when the first degree was exemplified for our Brethren at the home in Charlton. In March of 1966 an Armenian Night was observed with the work of the evening being done by the Armenian Brethren of Victory and other Lodges. A shish kebab dinner, prepared by our Brethren, was enjoyed by nearly 200 present. Many gifts have been received by the Lodge during this period. A set of square and compasses were presented by Bro. Virgil Brink and are presently in use on our altar. Another set, presented by Bro. Percy M. Bond, is being used by our Senior Deacons. The Three Great Lights were donated by Bro. Milton F. Ede for use in the instruction of candidates. Bro. "Milt" also presented a ballot box to be used for the same purpose and a 75-cup coffee urn, which is greatly appreciated at collations. Wor. Bro. Stuart J. Fay presented a new State Flag from his brother, C. Norman Fay, and himself, in memory of Bro. Charles E. Fay, a charter member and Bro. Allen M. Fay, the first candidate to be raised in Victory Lodge. Bro. Howard Carey has made several presentations of wheelchairs, hospital beds, crutches, etc., for use of anyone who needs them. A pair of Trestle Boards were made and presented by Brothers Samuel McGolpin and James Tutunjian. An ivory gavel, presented to Wor. William S. Holdsworth in 1928, was presented to the Lodge for use by the presiding Master. The Golden Anniversary year of 1970 was to have been celebrated under the direction of Bro. Milton F. Ede, who began planning for this occasion soon after his appointment. This was not to be, however, as Brother "Milt" as he was fondly known, on the eve of his installation met with an accident; and about a month later The Great and Beneficent Author of our existence saw fit to remove him from his earthly duties and take him "to that undiscovered country from whose bourne no traveler returns." Wor. Bro. Ernest E. Fay accepted a second term as Master and has carried out the groundwork laid by Brother Ede. It is interesting to note that just twenty-five years ago, when Victory Lodge celebrated its twenty-fifth anniversary, Wor. Bro. Ernie's father, Wor. Bro. Stuart J. Fay, occupied the Oriental Chair as Master. Thus ends fifty years; and may the spirit which guided those who have plotted the course of Victory Lodge instill in us and those to come after us the courage, friendliness, and willingness to serve that has made Victory Lodge a shining beacon in Masonry.